“LG is an administrative head in the limited sense, and is not a Governor. He is bound by the aid and advise of NCT Government in areas other than those exempted”:CJI. The Supreme Court delineated the boundaries of power between the Lieutenant-Governor and Delhi Government by stating that the LG cannot interfere in each and every decision of the Delhi Government, and that the LG is bound by the aid and advise of the council of ministers of Delhi Government, except in matters of land, police and public order. The verdict was given by a Constitution Bench comprising Chief Justice Dipak Misra, Justice A.K. 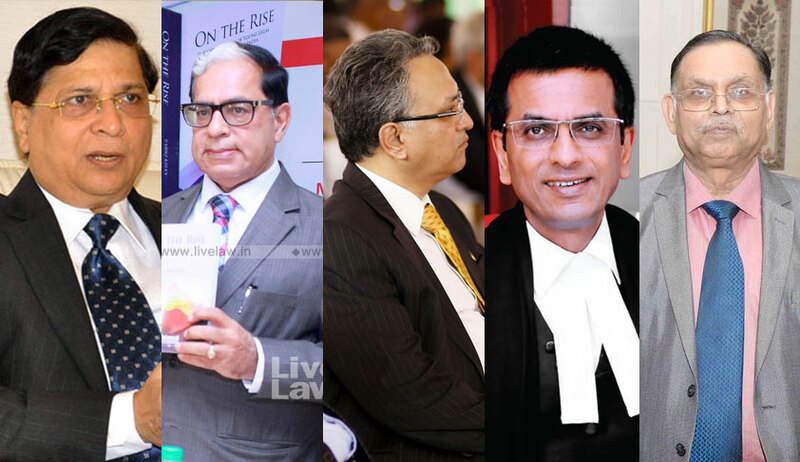 Sikri, Justice A.M Khanwilkar, Justice D Y Chandrachud and Justice Ashok Bhushan. The SC reversed the decision of the Delhi High Court which had held that LG was the “administrative head” of Delhi NCT, who was not bound by the aid and advise of the Delhi Council of Ministers. The power of LG to differ from the Delhi Government and make reference to President was only with respect to exceptional matters under Article 239AA(4) of the Constitution of India. The exceptional matters pertain to land, police and public order. Although decisions of the Government have to be communicated to the LG, there is no need to obtain the concurrence of LG in all matters. LG must work Harmoniously With Government. The judgment also emphasised that LG cannot mechanically refer all matters to President without application of mind. In a separate but concurring judgment, Justice Chandrachud stated that real authority to take decisions lie with the elected government and that titular head has to act as per the aid and advice of the elected government. “A balance between the State of NCT of Delhi and the Centre is required in the light of the special status of Delhi”, Justice Chandrachud said. Justice Ashok Bhushan, in his separate but concurring judgment, said that interpretation of Constitution must be on the basis of need of the time. The opinion of the elected government must be respected. Constitution did not provide that concurrence of LG must be obtained in all matters, Justice Bhushan stated. Seven months after it reserved its judgment on December 6 last year, the Supreme Court put to rest the power tussle between the Delhi government, with Chief Minister Arvind Kejriwal at its helm, and the Centre, wielding authority through the Lieutenant Governor. The verdict of the constitution bench of Chief Justice Dipak Misra and Justices A. K. Sikri, A. M. Khanwilkar, D. Y. Chandrachud and Ashok Bhushan came on the Kejriwal government’s challenge to the 2016 Delhi High Court ruling, which declared the LG as the ‘administrative head’, not bound by the aid and advice of the Council of Ministers. The Legal eagles representing the Delhi Government before the five-judge bench were senior advocates Gopal Subramaniam, P Chidambaram, Indira Jaising, Rajeev Dhavan and Shekhar Naphade. GOPAL SUBRAMANIUM- The LG is a titular head who has superseding powers only in matters related to police, public order and land. The functionary Cannot summon all files or paralyse governance by delaying decision making. PChidambaram - The LG is not the administrative head in most matters; he is not a “Viceroy”, but simply an agent of the President whose powers depend on the pleasure of the President. Rajeev Dhavan- The Delhi Government has crucial powers. The LG shall step in only in the case of emergency. The Delhi High Court had on August 4, 2016 declared that Lieutenant Governor is the administrative head of National Capital Territory of Delhi and he is not required to act on the advice of the Delhi Cabinet. The High Court Bench headed by Chief Justice G.Rohini had dismissed a batch of Petitions by the Delhi AAP Government challenging the powers of Lieutenant Governor. (v) The matters connected with ‘Services’ fall outside the purview of the Legislative Assembly of NCT of Delhi. Therefore, the direction in the impugned Notification S.O.1368(E) dated 21.05.2015 that the Lt. Governor of the NCT of Delhi shall in respect of matters connected with ‘Services’ exercise the powers and discharge the functions of the Central Government to the extent delegated to him from time to time by the President is neither illegal nor unconstitutional.